The paper tries to answer a simple question: how efficient can crowdsourcing be at predicting privacy preferences in location sharing? The answer is, well, pretty efficient. The secret is the fact that particular types of places have very specific privacy preferences patterns. 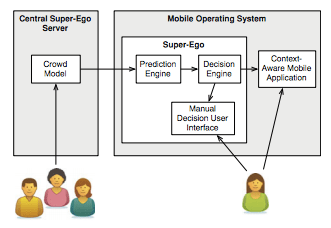 On top of a set of prediction algorithm, we design Super-Ego: a simple architecture, in which every mobile operating system API contains a privacy layer that can use crowdsourcing and user input to decide whether to release information to a mobile application. Developers of context-aware applications are faced with a tough challenge: powerful privacy controls are essential to maintain user trust, but they are also hard to use and not adequate in all situations. To address this tradeoff, we present Super-Ego, a crowdsourcing framework for privacy management of location information in ubiquitous environment. We study how crowdsourcing can be used to predict the user’s privacy preferences for different location on the basis of the general user population. The crowdsourcing methods are evaluated in a 2-week user study in which we tracked the locations of 30 subjects and asked them to provide privacy preferences for the locations they had visited. Our results show that by employing simple methods for semantic analysis of locations and by profiling the user’s privacy inclination, our methods can accurately predict the privacy preferences for 80 % of the user’s locations. By employing semi-automatic decision strategies, which ask the user to decide regarding the privacy of some of the locations, the accuracy rate raises to 90%.